The only non-pastel print in a large ($46.88, 75% off $187.50). 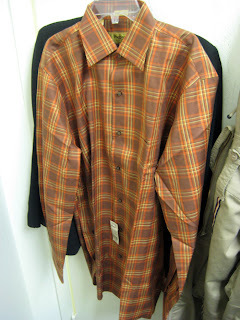 I like to get him at least one Paul Stuart shirt a year. He's not very preppy, but on proper occasions looks really cute in Paul Stuart preppy-ish shirts. Hopefully it won't be a horrid color on him. 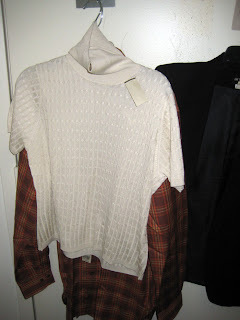 And I caved and got this silk sweater for $25.40, was $129 (women's is 80% off, most of the men's is 70 - 75% off). There's still a little more stock for women than men. It didn't look like much to me on the table but I was drawn to its lush creamy hue. And when I tried it on, I fell for the perfect fit. There's just something about these Paul Stuart sweaters that makes you feel all put together, so I try and get one a year for work (perfect for board meetings, interviews, days you go for a more professional look that doesn't involve jeans...). Quality staples are never to be underestimated. Scarves are square and sadly underwhelming but discounted 95% (about $9). Same for other accessories. There are still some fabulous grandpa caps & hats in men's accessories, all 70% off $128 - $200+. Look for further discounts on the last day, but expect stock to be well picked through. Sale ends Thursday, be sure to go to website for more information. You know how TP feels about Paul, so it will be no surprise we love this post! I just can't resist some Paul Stuart preppy! You'll have to schedule a trip to coincide with the next sample sale, TP. And I think the consort would be very happy with the men's selection.